We process and ship orders within 2 business days via the US Postal Service. Express orders are processed and shipped next business day. We offer three methods of shipping so you can decide how quickly you would like to receive your order. Free shipping orders are shipped Priority Mail and are usually delivered within 6 to 8 business days. Free shipping is only available within the United States. When your order ships, you will receive an email including a link where you can track delivery of your order through the US Postal Service. Tracking information is not available for First Class Mail. You can also track and view the status of your order (and the personalized information for your products) by clicking here and entering your order number and email address. We make every attempt to verify and correct shipping addresses through our shipping system, however, should an order be returned to us due to incorrect or insufficient address, shipping charges will be incurred to have your order reshipped. International - Orders shipped outside of the United States may incur customs fees, duties and/or taxes. Recipient is liable to pay these charges to the carrier upon delivery. It is a legal requirement that we declare the full transaction value of the contents of all packages. Please check the applicable rates with your local customs authority before placing your order. A return policy on personalized products is extremely difficult to provide, as each product is uniquely created for a specific individual and cannot be resold. It is our goal that all of our customers be completely satisfied with our products and service. Therefore we provide the following return policy to accomodate our customers as reasonably as possible. What if KD Novelties makes a mistake? It does not happen often as we proof read our books and personalized products twice before they are printed and assembled. However, in the event that KD Novelties makes a mistake, we will correct and replace the same product with the corrected information at no charge or your money back. Create-A-Book – Since the Create-A-Books are printed on special white paper, you can mail the book to us and we will disassemble, reprint, reassemble and reship your book for a nominal fee of $3 plus shipping and handling. No refund will be provided. Best Books – Cannot be repaired as they are printed on paper specific to each book, however, we will print and ship another book at 10% off the original price plus shipping and handling. No refund will be provided. Personalized Music CDs – Cannot be replaced or refunded if incorrect information is provided to us. Please listen to the child's name before purchasing to make sure it sounds correct as each character may pronounce the name differently. We will only replace Music CDs if they are defective, (i.e. skipping), provided they are not scratched upon return. Personalized Photo DVDs – Cannot be replaced or refunded if incorrect information is provided to us. We will only replace DVDs if they are defective (i.e. skipping), provided they are not scratched upon return. The quality of the child’s face in the movie will be as good as the picture that is provided to us. 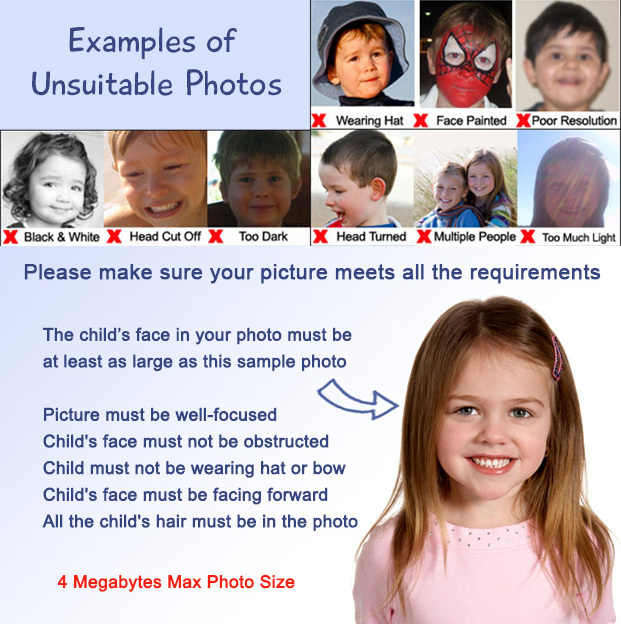 Therefore please make certain that your picture is of good quality and meets our required specifications. View Sample Picture and Guidelines. Contact us at 845-510-4090 or e-mail us at info@kdnovelties.com within 5 days of receiving your order. Depending on the product that is damaged, we may ask that it be returned to us. A refund or replacement will not be provided if we are not notified within 5 days of when the order is received. Contact us at 845-510-4090 or e-mail us at info@kdnovelties.com no later than 3 weeks after placing your order and we will ship a replacement immediately. Orders will not be replaced or refunded after 30 days from when the order was placed.